But before I ramble on, how many you know what it means when I talk about ‘Braising’ meat? To braise food means to cook it slowly and for a long time after coating it with flour/cornstarch, browning or searing it in some type of fat. The meat is then removed from the pot, vegetables are seared typically, the meat put back in and then liquid is traditionally added to the dish to prevent it from becoming dry during the cooking process however you do not want a lot of liquid as you’re not making soup. A tight fitting lid on the pan or pot is necessary to hold in the moisture during the braise. After that the covered pot is then either cook low and slow in the oven or on top of the stove over a low heat. I mean seriously, don’t you just want to dive right into that pot and swim around in that yummy scrumptiousness? Literally as I went to pull them up out of the pot, the meat just fell off the bone. I so wish you were all here to try these as they were SO amazing! Wait, let me retract that. Okay so I kinda didn’t really mean that only because that would mean I’d have to share *wink* LOL Trust me, it was hard enough sharing with Mr. Fantabulous! In a large dutch oven, heat the oil over medium heat. Add in the pancetta and cook, stirring occasionally until it’s crispy an the fat has rendered. ~4-5 minutes. Remove from the pan and set aside (cover with a paper towel). Leave the fat in the pot and set aside. Pour the flour in a large pie pan, season with 1 tsp each salt and pepper; mix to combine. Taking a few ribs at a time, dredge them in the flour, shaking off any excess. Place the dutch oven back over the heat and turn the heat up to medium high. Working in batches, add in the flour coated ribs. DO NOT CROWD as they won’t sear up correctly. Brown on all sides, ~5-7 minutes. Remove from the pot, place on a plate and continue browning the rest until they are all done. When the short ribs are done browning add the onions, celery, carrots and garlic to the dutch oven. Season with the remaining salt. This will help draw out the moisture from the vegetables. Saute until soft; about 8 minutes. Add in the tomato paste and cinnamon (I’m telling you, trust me on this one!) and cook for 2-3 minutes. You’ll want to stir this and keep an eye on it so the tomato paste doesn’t burn. Add the pancetta and short ribs back to the pot. Pour the wine in and bring to a simmer. Cook this as you’ll need it to reduce by half. ~25-30 minutes. Add in the thyme, rosemary, bay leaf and just enough stock to barely cover the ribs. You don’t want to submerge them as you don’t want to make soup. You should still be able to see the tops of the ribs. Bring to a slow boil, cover it and place in the preheated oven. Braise, covered in the oven for about 2 hours. Every say 45 minutes just check the liquid level. You want to be sure it doesn’t evaporate. If it gets low, add more of your stock. After about 2 hours, remove the lid and cook for another 45 minutes or until the meat is super tender and literally just pulls off the bone. 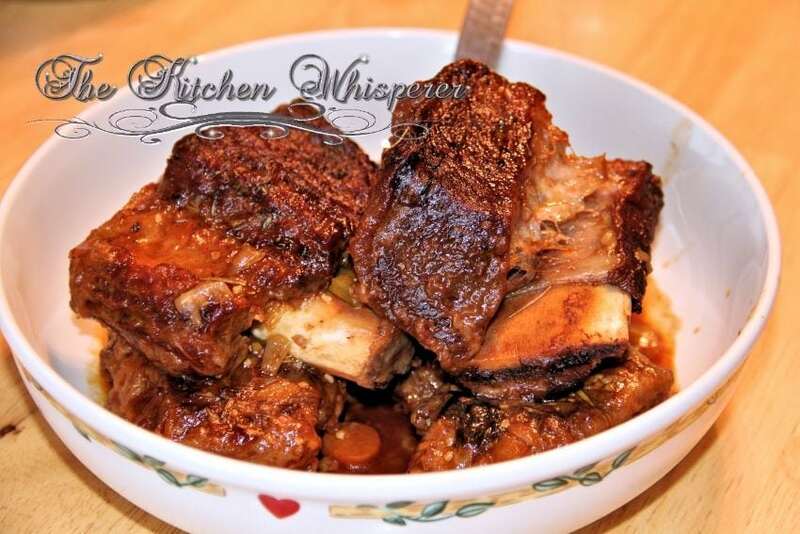 Remove the pot from the oven, using a slotted spoon, remove the beef ribs and place on a serving platter. Remove the bay leaf from the pot. Place the pot over medium high heat and bring to a boil. In a small bowl, mix the cornstarch and 1/2 cup of stock to form a slurry. Pour the slurry into the dutch oven and stir well until the sauce thickens into a gorgeous chunky-vegetable gravy. Adjust the salt/pepper per your liking. I serve this with skin-on mashed red potatoes and corn. This is such a total comfort food for me. Would this recipe work using a red wine? Yes it would; go with a chianti or a burgundy wine! Oh, these sound wonderful! Great pix too. Thanks for sharing. We’re having a party at Tumbleweed Contessa and these would be a great hit! Hope you can drop by.